This new rug is from a Joss & Main event that has since ended, but you can find the same one here, too. It’s great because it’s big, thick, and has a beautiful texture/dimension to it. I’m in love with it! 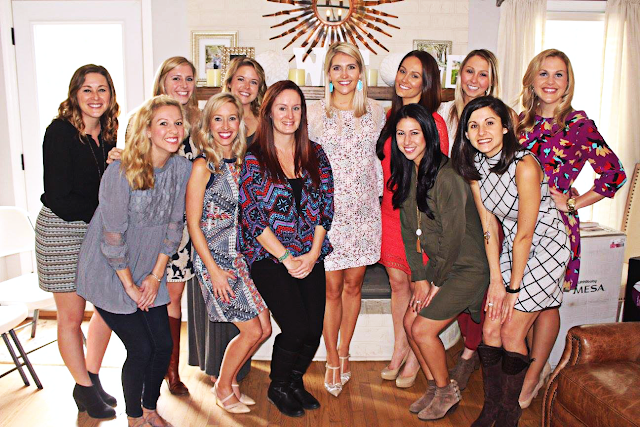 My best friends threw the sweetest baby shower for me on Saturday. Here’s some of the crew that came. I’ll share more photos and details later this week! My heart is very full. I wore this dress (not maternity, but sized up to a medium for reference) and hey! 50% off. Plus, these earrings. Wandered into Peyton William on King Street on Sunday and scooped up these earrings. There is so much good stuff in there—all handmade by the same designer. I’ve been having a lot of fun with jewelry since being pregnant since my wardrobe is pretty limited. Couldn’t resist these. I love turquoise. I thought about saving this for my 34 week pregnancy update this week, but I’ll have plenty to share there as it is. My Great Aunt Carolyn sent me the sweetest package for our W. She joined a knitting club at her church and learned to make these adorable hats, baby blanket, and scarf. Handmade gifts are so special—especially when they come with a note to save forever! In my new Twine and Twig shell necklace and neutral layers. It’s Beautycounter’s Makeup Monday again, y’all. This is just happening during February, by the way. Did you know that mica (the sparkles in makeup) mining is one of the top child slaveries in the world? Children (as young as 5 years old) are sent into the mines under harsh conditions for up to 12 hours each day so that you can have glittery blush and eyeshadow. Even if you are using a safe mineral-based makeup, chances are they may be getting their mica from a child labor source. The great thing about Beautycounter, we are a B Corp. This means we have to meet extremely strict standards in regards to the sustainability and ethical practices of the ingredients we use. Our blush duos not only come with a Certificate of Purity (no heavy metals), but peace of mind knowing that the mica comes from ethically extracted sources. Here’s how our expert makeup artist uses the brush and the blush duo to create a natural contour. Watch below …get your FREE brush here! Your orange top at the end is so cute! Where did you get it from? LOVE those earrings!! If they weren't sold out, I'd scoop them up!! Do you use a self tanner? Jealous of your tan! You look great! Loving the rug! !